Round about 200 days before the Nordic Ski World championship 2019 in Seefeld, the JaR-athletes Stefan Kraft, Michael Hayböck and Mario Seidl came together for the traditional Jumpand Reach for friends meeting. Also the JumpandReach-Familiy, the closest friends and mentors like Diana Langes Swarovski came together for a cozy, sporty and educational gathering in a great atmosphere at the Hotel Klosterbräu&Spa of family Seyrling. The thought of the home World Championship put this years’ JumpandReach for friends meeting in a special light. It was a unique atmosphere at our E-Bike tour with TVB director Elias Walser as our personal E-Bike-Guide. 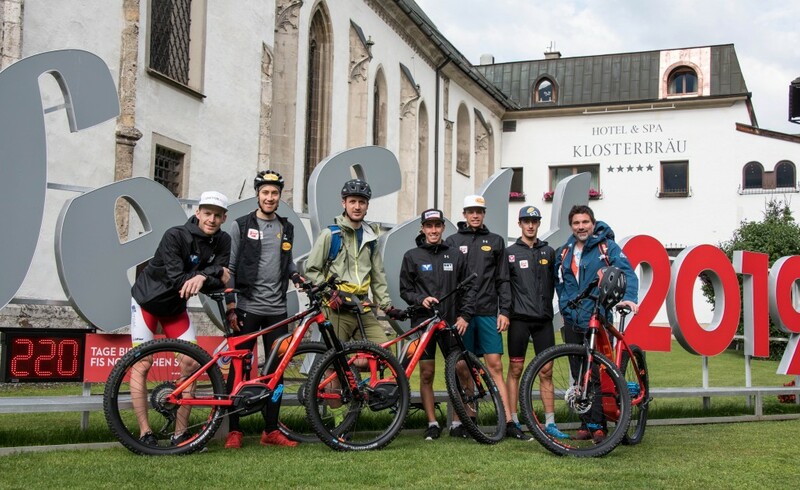 We explored the “Olympiaregion Seefeld” on two wheels and the tour offered the JaR-athletes a special view of the place, where in February it will be fought about gold, silver and bronze. So, it was a little like “silence before the storm” for Stefan Kraft with roommate Michael Hayböck, Mario Seidl and the JumpandReach family on the way to the Rootmosalm at the Gaistal. On Sunday the JumpandReach family found a pleasant and cheerful way to end this years’ JumpandReach for friends meeting with a short hike with Maximilian Schulz and a visit to the new “Spieljochbahn in Hochfügen”.